A technical term used in later rabbinical literature generally to indicate authorities who are contemporaries of the person quoting them or who belong to the generation immediately preceding him. It is especially applied to the rabbinical authors following the age of the "Shulḥan 'Aruk"—the end of the sixteenth century. Says Rabbi Zeira in the name of Raba bar Zimona: "If our ancestors [ ] were angels, we are human beings; and if they were human beings, we are asses" (Shab. 112b). Says Rabbi Johanan: "The finger nail of the ancestors is better than the whole body of the descendants." Said Resh LaḲish to him: "On the contrary, the descendants are greater; for, in spite of their oppression, they study the Law." Said he (Johanan) to Resh LaḲish: "The Temple will decide the question; for it was restored to the ancestors and not to the descendants" (Yoma, 9b). Says Rab Papa to Abaye: "Why were miracles done to the ancestors [ ] and not to us?" Said Abaye: "The ancestors sacrificed their lives for the sanctification of the Name [the service of God], and we do not" (Ber. 20a). With reference to the Mishnah (Mid. i. 2), which speaks of the heavy punishment meted out to the guards of the Temple who were found sleeping while on duty, Johanan says: "Blessed are our ancestors [ ], who were punished even for succumbing to sleep" (Tamid, 28a). From all these passages it is apparent that even in Talmudic times the ancient authorities were considered superior in religious conduct to those of later generations. This belief in the authority of the past, and, consequently, the lack of confidence in the present age and its immediate predecessors, are strongly upheld in the age of the Geonim and by the more strict observers down to our own era. Sherira Gaon, in the tenth century, says: "One who opposes a single word of the teachings of the Talmud is like one opposing God and His Law; for the words of the rabbis are the words of the living God" ("Sha'are ẒedeḲ," introduction; see Weiss, "Dor," iv. 166). In the twelfth century R. Tam writes to R. Samson of Sens, who objected to a passage in Rashi's works: "God forbid that one should think for a moment of opposing the angel of our Creator" ("Sefer ha-Yashar," quoted by Azulai in "Shem ha-Gedolim" under "Samson of Sens"). Israel Isserlein of Marburg in the fifteenth century says: "No one has a right to contradict the rabbinical works that have been accepted by the majority of Israel" ("Terumat ha-Deshen," Pes. No. 241). 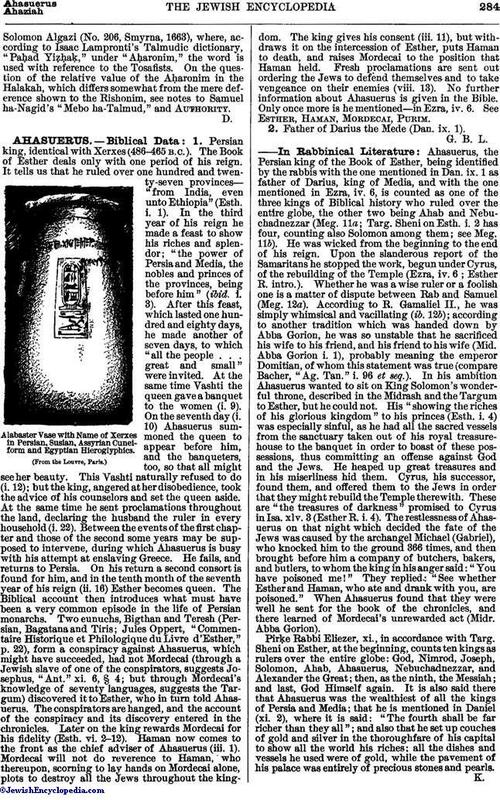 Similar expressions of a strict belief in the authority of the past, on the ground that past ages were always superior to all succeeding generations, are found in rabbinical literature.See Elijah de Vidas (sixteenth century), "Reshit Ḥokmah," ed. Fürth, p. 41a; Joseph Caro (1492-1575), in his notes on "Ṭur Yore Dea," ed. Warsaw, 1881, § 112, p. 177b, who attacks Jacob ben Asher for his criticism of Solomon ben Adret, "to whom all the paths of heaven were known"; Menahem Mendel Krochmal (died 1661), "Ẓemaḥ ẒedeḲ," No. 6; Lipmann Heller (1577-1654), in his commentary on the Mishnah 'Eduy. v. 1, who says: "Every religious authority is, as a matter of course [ ], superior to the succeeding generations"; Menahem di Lonzano (died 1620), in his preface to "Derek ha-Ḥayyim" quoted by David Pardo in the preface to "Mizmor le-David" (Leghorn, 1818), and by Solomon Ḥazan in "Ha-Ma'alot li-Shelomoh" (Alexandria, 1894), p. 64a; Azulai, "Shem ha-Gedolim," under "Moses ben Naḥman"; Israel Landau, in the "'Aruk," edited by his son, M. I. Landau, under the title, "Rabbinisch-Aramäisch-Deutsches Wörterbuch" (Prague, 1835), ii. 266; Moses Sofer (1762-1839), in his responsa on "Eben ha-'Ezer," ii. 156; Lubetzki, rabbi in Paris, in his "BidḲe Batim" (Paris, 1896), p. 44b; Eliezer Papo, in his dictionary of religious ethics, "Pele Yo'eẓ," under "EpiḲoros." "You have given attention to the later authorities, David ha-Levi of Ostrog [died 1667] and Shabbethai Cohen [died about 1662]. This is not my method. My studies are limited—thank God!—to the Talmud and older authorities [ ]. And why should we nibble at the bones of the later authors when we can feast on the meat upon the golden table of the Talmud, Alfasi, Maimonides, Asher, the nails on which everything hangs [see Isa. xxii. 23]; for the later writers [ ] confuse man's mind and memory. The good which is found in their works comes from our teacher, Rabbi Hoeschl of Cracow [died 1663]; and in that which is their own I can show any number of mistakes on every page. You would therefore do better to sell their books and buy an edition of the 'Tur' with Joseph Caro's commentary". 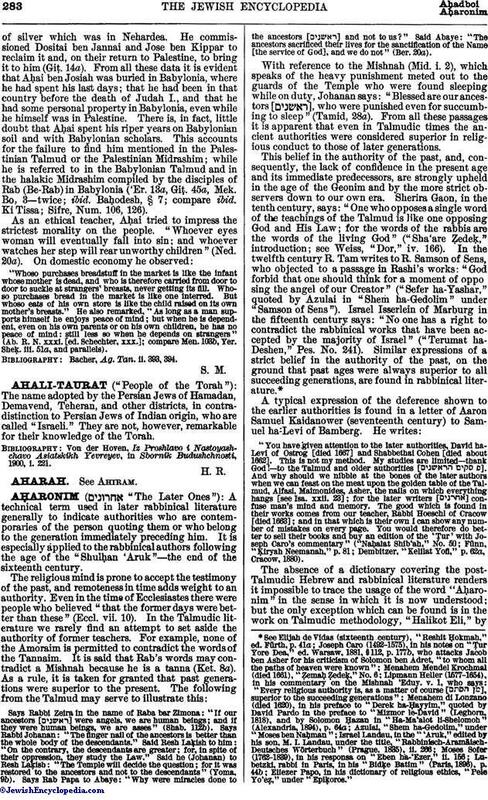 The absence of a dictionary covering the post-Talmudic Hebrew and rabbinical literature renders it impossible to trace the usage of the word "Aḥaronim" in the sense in which it is now understood; but the only exception which can be found is in the work on Talmudic methodology, "Halikot Eli," bySolomon Algazi (No. 206, Smyrna, 1663), where, according to Isaac Lampronti's Talmudic dictionary, "Paḥad YiẓḥaḲ," under "Aḥaronim," the word is used with reference to the Tosafists. On the question of the relative value of the Aḥaronim in the Halakah, which differs somewhat from the mere deference shown to the Rishonim, see notes to Samuel ha-Nagid's "Mebo ha-Talmud," and Authority.